Flavours of South Dublin Food Festival is scheduled to take place in Rathfarnham Castle Park on Sunday 23rd June 2019 from 11.00 am – 6.00 pm. This unique food festival will showcase the very best cuisine from the locality, and aim to highlight the diversity and vibrancy of the food culture in the county. 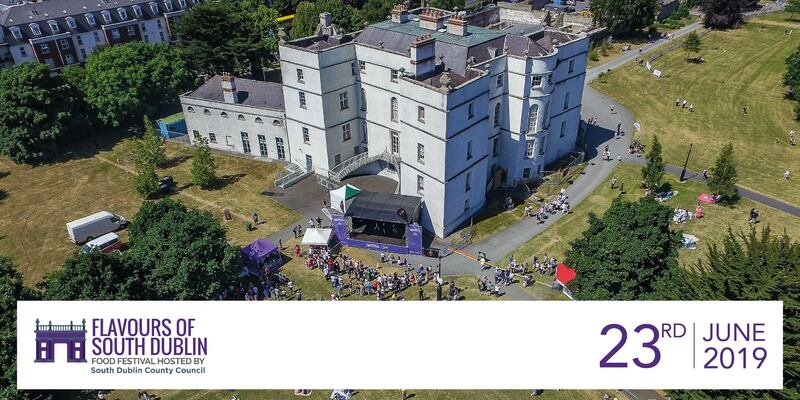 This is the third year of the festival, it is free to attend and guarantees to be a great day out for the whole family with entertainment for all ages including live music and dance, demo kitchen, face painting, balloon modelling,… but also free guided tours of the Castle (www.rathfarnhamcastle.ie). The Festival will take place in the grounds of Rathfarnham Castle, which dates from Elizabethan times and is probably the earliest example of what is termed a ‘fortified house’ built in Ireland. Over the past thirty years, an extensive programme of preservation and restoration has secured the historic fabric of the building and returned the principal Georgian interiors to their former glory.